How to arrange your flat and pack furniture together right? Have you ever visited a friend’s flat only to get taken aback by the awkward furniture arrangement? Or is it your own place that feels somewhat cramped or anonymous and bare? Then, maybe, you should consider rearranging your furnishings to optimise space, enhance functionality and bring up that homely feel your place has been lacking. And what should you keep in mind when you get things moving? We have to clear up one thing here. Balance doesn’t necessarily mean symmetry. So don’t get the tape measure out to calculate distances and jot down the exact space measurement between the wall and the sofa in inches. Instead, place feature pieces in such a way that they naturally correspond to each other. Just picture your two comfy armchairs, positioned strategically askew in the two corners of the narrow side of your living room, separated by an ellipse coffee table. Or you could move your settee closer to the fireplace and get off the conventional path of “gluing” all your furniture to the wall. This way, you will immediately achieve a cosier feel, a floating look and better functionality. After all, who wants to relax in a sitting area that resembles a dentist’s waiting room? Avoid grouping together ill-matched furniture, such as wooden chairs, positioned opposite a futon bed, for instance. Promote conversation by creating intimate seating areas, so verbal exchange between people is comfortably audible. The idea works for large open-space rooms, which can accommodate more than just the essentials. Experiment and create several designated areas for different activities. So, you could concoct a compact home office next to the TV-watching zone by using the sofa as a convenient partition. Another idea is to set up a separate dining area in your living room instead of having lap meals in front of the TV. 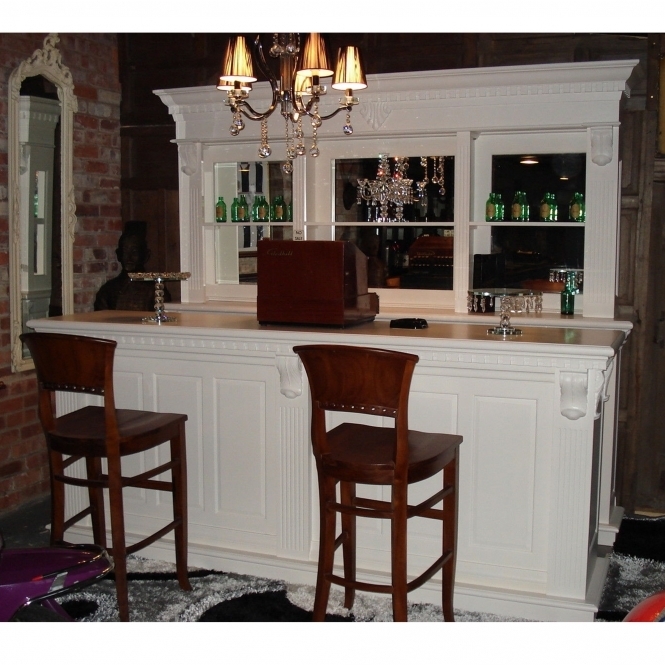 The options for utilising your large living space are vast, so be adventurous and try out different scenarios like a bar perhaps, based on your lifestyle and family needs. Ensure that you begin your interior rearrangement by determining the right starting point. It’s simply much easier to find a good spot for the large furniture first and float around the smaller pieces to form separate activity zones. So, your flat is on the small side? Then, considering space limitations is a key to achieving comfort and good function, without compromising aesthetics. This means that you need to reevaluate your interior design taste and style. Do you really need all these overly decorative features in a small room? In other words, simplicity and essentiality are the leading concepts that you should follow, in order to accomplish a clean and functional look for your room. For instance, you can say goodbye to floor lamps that take up space and install a few wall-mounted light fixtures. You can also consider replacing the two small coffee tables with one if you reconfigure the seating arrangement. Think out of the box and swap rooms if you need to. You don’t have to feel constrained by convention and do exactly what “it says on the label”. So, why not move your narrow living room into the large master bedroom? After all, you fall asleep every night without fail. So, is your bedroom size that important? 4. Are you forgetting functionality? Do you always risk bumping your head in the bottom bookshelf every time you want to get up from the sofa? Or how many times you ask visitors to mind the step when they move their chairs to leave the dinner table? Ensure that furniture is arranged in a way that is functional and comfortable to use. Use space in a smart fashion and place the furniture to fit every situation. This means that you shouldn’t have to ask your guests to move when you need to reach for the napkins in the kitchen drawer. Multifunctional pieces of furniture or interior features can make daily life a breeze. Scrap the heavy ironing board and de-wrinkle your laundry on the breakfast bar table, once the kids have gone to school. These are rather rare but if you own an antique cabinet with a fall down door, you can use it as a coffee table if you place a couple of armchairs on each side of the unit. You don’t have to improvise by repurposing your furniture. The market is inundated with clever multifunctional furniture designs that can suit your individual needs. 6. What’s wrong with small sized furniture? Nothing! Smaller pieces have versatility and offer more functional and flexible interior design solutions. For example, a large oversized bookcase can fit on one wall only, whereas two or three smaller units can be positioned differently to create more space and improve style. Play with focal points! You don’t necessarily need a wall-size mirror in a small living room when you can cleverly reflect the room with two smaller ones. Rooms with multiple entries should be furnished with traffic flow in mind. Avoid placing a large piece or a seating grouping where they may obstruct free movement. Leave enough space between the sofa and the coffee table, so people can pass through without knocking a glass or stepping on someone’s foot. Takeaway: Make sure that traffic flows naturally throughout the room. People should also navigate in between rooms in a smooth and unobstructed manner. If zigzagging is the only way, something’s wrong with your furniture arrangement. Who would be happy to endure an entire movie on an uncomfortable settee? Add some cushions to your main seating furniture to ensure comfort and pleasant relaxation. Also, think convenience by avoiding furniture arrangements of awkwardly positioned pieces. There is nothing more unthoughtful than making people stretch, lean or get up every time they need to reach for their drink. Style and design do not have to be at the expense of comfort. If people get a neck pain every time they watch a programme on your TV, then it is likely that the set has not been installed at the right height. Venture with angles when arranging furniture in spacious square rooms. Placing large pieces diagonally achieves a floating feel and helps direct the eye towards other focal points in the room. But if your living room is long and narrow, stay away from positioning furniture askew. This way, you will prevent the room from looking cluttered and overly furnished. Instead, ensure simplicity by utilising space through existing features. For instance, place a narrow bookcase next to the protruding corner to keep things aligned. Or furnish the small alcove with a wall light and move the floor lamp to a different room. Long rooms that fall on the dysfunctional side can be easily split into two rooms. Whether you use a physical partition like a screen divider, such as a bookcase or you showcase their different roles through the type of furniture you fit in each section, you can have two well-functioning zones that suit a specific activity or pastime. Reconsider your furniture arrangement if the result is a bare, ugly or blocked view. If you are not an art lover, install a large mirror on the blank white wall. Hide the slightly ripped and unaesthetically looking back of your sofa by moving the piece, so the back faces the wall. Open up the room by moving furniture, which partially blocks the window. Allow more natural light in the room and enjoy the view. And furniture backs don’t look great from the outside, either! You may be used to the way things are at home but a visitor will notice everything that is “off” with the room. So, ensure to make that first impression! Accentuate specific features by placing them in view, whether it is a pretty vase, a modern sculpture or a colourful fruit bowl. Also, you may not have noticed that two of the dining chairs are not placed on the rug but your guest may well do. Or why not align properly the slightly tilted painting on the wall, so you can emphasise its artistic quality? Detail matters. It’s simple as that! 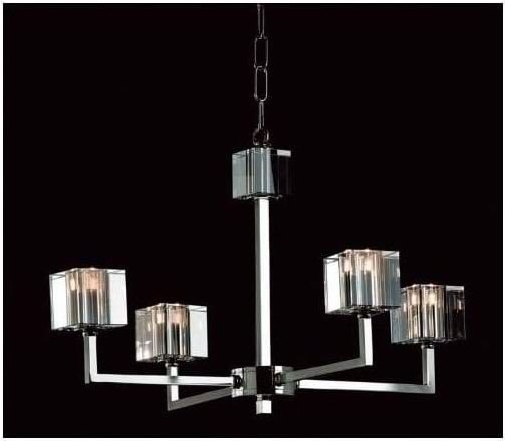 Lighting is important in every interior design project. If planned carefully, it can expand a room or change its ambience.You can also use lighting to complement your furniture arrangement or bring out a specific focal point in the room. With the right positioning of light fixtures and lamps, you can enhance your interior and achieve a particular look and style. You don’t necessarily have to follow the existing light fittings when you rearrange your furniture. For instance, you can easily resort to professional assistance, in order to move off-centre light fixtures. By relocating the light over the table, you will be able to light up your dining area without having to fit the furniture grouping in an ill-suited place. Always consider the scale and proportion of your furniture pieces, as well as the room’s size and shape. 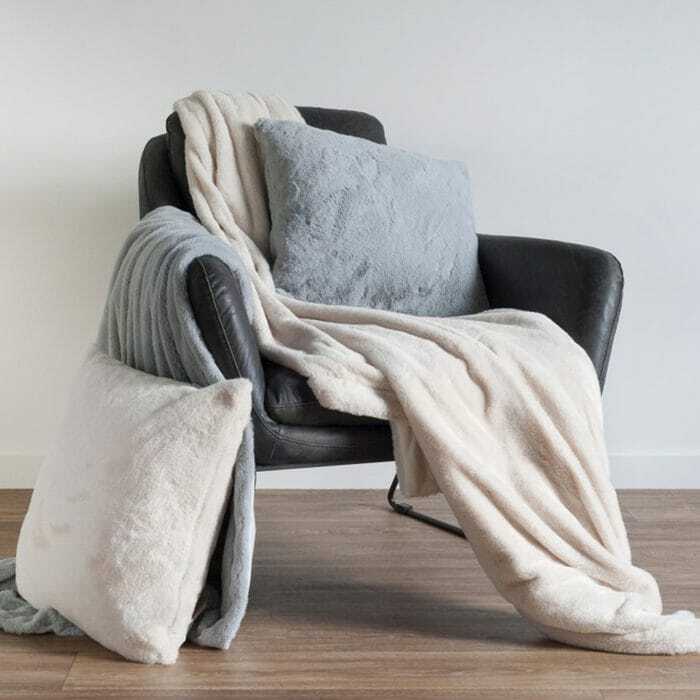 This will help you arrange your furniture in the most comfortable, functional and aesthetic way that fits your personal style and matches your preferences. The key is to experiment and try out different ideas. So, don’t be afraid and go for it! Be sure to check out the massive range of bedroom furniture we have online at "Homes Direct 365"
via Blogger How to arrange your flat and pack furniture together right? According to Ian Sansom, an accredited author, while bedroom furniture is more often than not disregarded as just a mundane element of a home, its subsequent importance in our everyday life is surprisingly profound. In reality, furniture is a clear indicator of exactly who and what we are or deem ourselves to be. The underlying history of both the bedroom and its subsequent furniture offers a captivating preview of the early life and interactions of early societies. As with the case with humans, our homes particularly our bedrooms are continually evolving. While ancient nomadic communities generally used the floor as their resting places and relied on animal hides to cover themselves throughout the night, the modern bedroom features significant advancements both in comfort and technology. Unlike the early societies, modern bedrooms lay considerable emphasis on exclusive furniture and optimal privacy. But while early societies never really laid focus in the beauty, privacy and general appeal of the bedroom, they surprisingly invested in creating pertinent bedroom furniture. So exactly where did bedroom furniture come from and who used it? 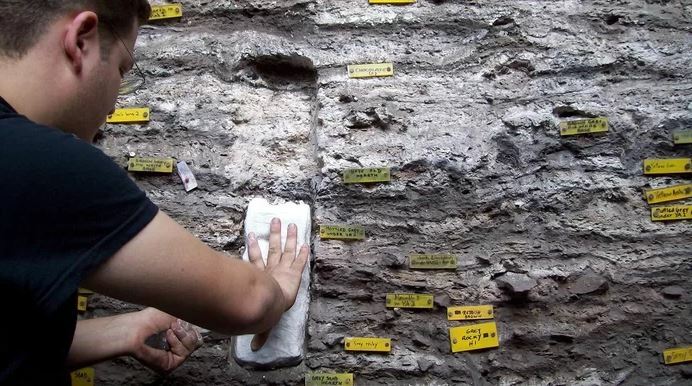 In their quest to unravel the history and mystery of the ancient South African tribe of Sibudu, archaeologists discovered scrabbles of beddings made from sedge grass believed to date as far back as 77,000 years. These aromatic leaves boast a pleasing scent which amazingly also doubles as a repellent for mosquitoes plus other insects. The Sibudu community used a very effective technique (which surprisingly still finds use to date) to make woven bed mats and other furniture accessories from this grass. Ancient Egyptian communities used fibers and wood to design their numerous furniture pieces including bedroom furniture such as beds. They carved the wood into ornate figures and shapes for use in and around their homes. They decorated their bedrooms with curtains hanging around their beds and also used marble as the underlying material to design their floors. For their beds, they created raised rectangular constructions characterized by perforated provisions for ventilation. They further accentuated their bedroom furniture such as their then armoires with clawed feet made from animal bones or valuable wood for a touch of class. 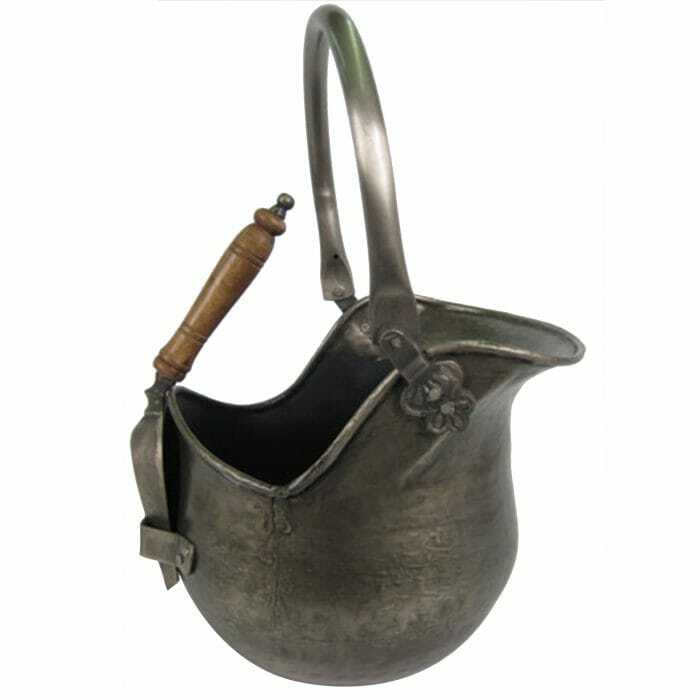 As earlier mentioned, while furniture for many simply stands as ordinary additions into the house accessories, it is a wonderful representative of some of our innate qualities. For instance, our wardrobes are representatives of whether who we may have ultimately become and or where we may have subsequently gone. E Nesbit in 1908 published an account named The Aunt and Amabel. In this narrative, Amabel, a very young girl, is punished for chopping off flower heads in their greenhouse by her aunt. Enraged, her aunt confines the little girl to a spare bedroom, and it is here that Amabel discovers a railway timetables book with a particular destination named Whereyouwanttogoto. While Nesbit noted this as odd’, what is even more astonishing is the station’s name. Neither was it Cannon Street or Euston or even Marylebone, it was Bigwardrobeinspareroom. For this reason, Amabel begins her adventure. Similarly, beds function as imagination transporters. It is a well-established fact that many writers enjoy working on a horizontal inclination. 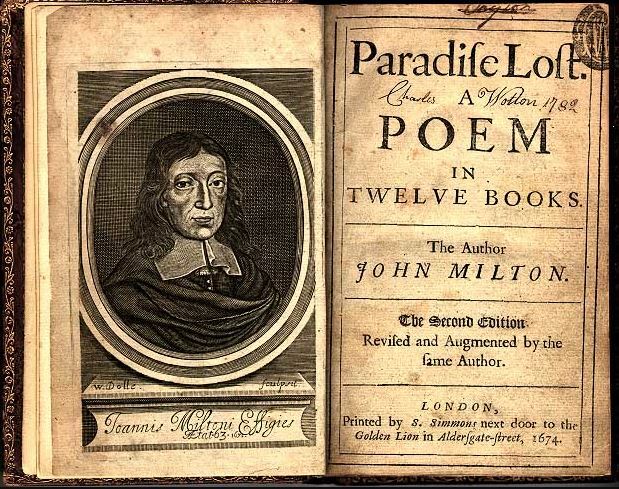 Much of the History of World War Two by Winston Churchill and Paradise Lost by Milton was composed lying in bed in the morning. The value of bedroom furniture and in extension all furniture pieces lies deep within its history. While we may create it, it however consecutively makes, defines and shapes our daily lives. We have a massive range of bedroom furniture from antique style right through to contemporary and quirky so please do come and have a look at our ranges on the links below, and here are a few examples of our modern bedroom furniture. You can have your makeup, perfume, and accessories to hand, so it makes the effort of getting ready, well, effortless! 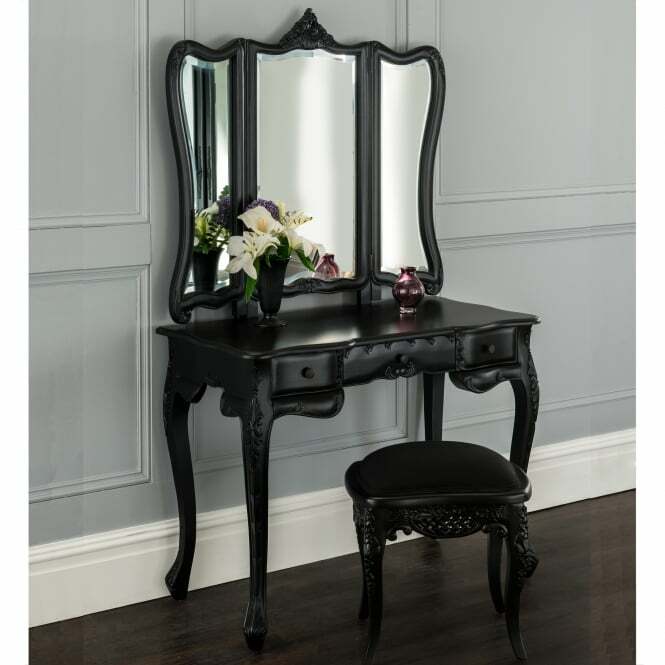 The table can bring a touch of old Hollywood diva glamor into your life. A simple piece of furniture that can make you feel good has got to be worth investing in. The table can help keep your bedroom clutter free as well. So not only will you look gorgeous, your room will too because all of the little bits and pieces that are hidden away. 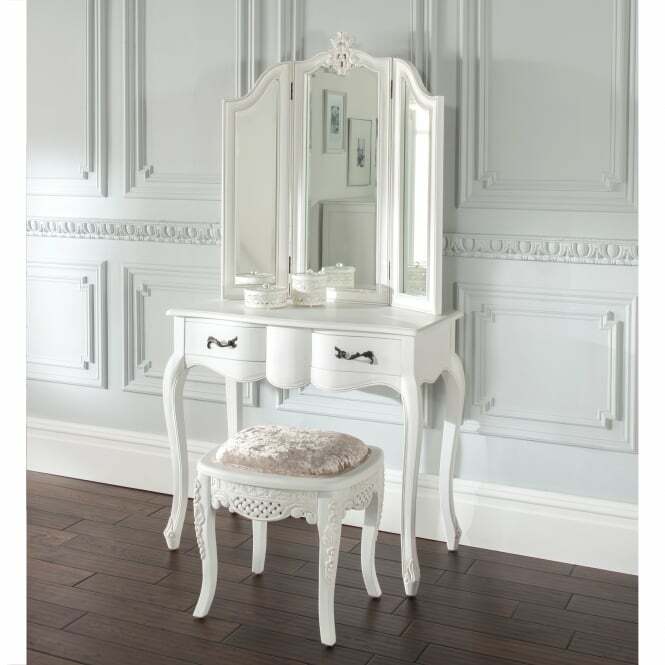 It's rare to find beauty and practicality in a single piece of furniture, but dressing tables have both of these in abundance. 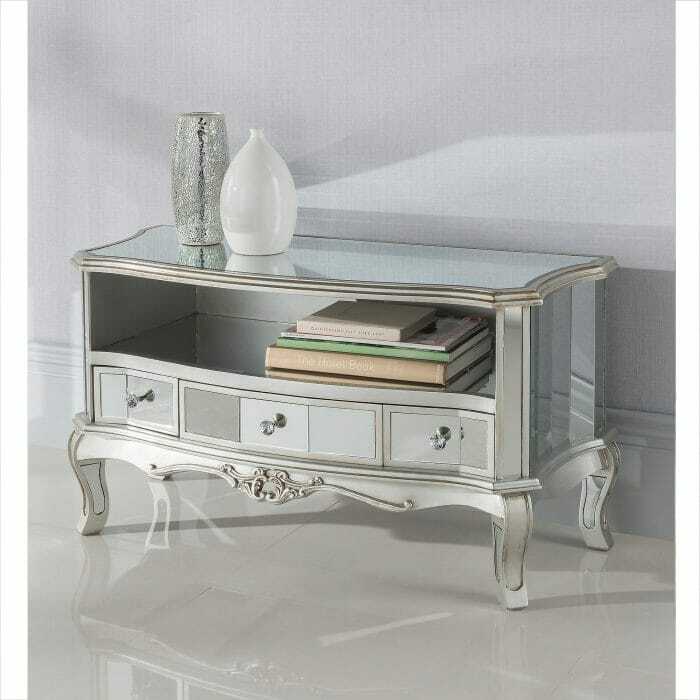 Whatever the style or material you choose for your dressing tables, be sure to pick one that you can store all of your valuable items of jewellery or accessories in. 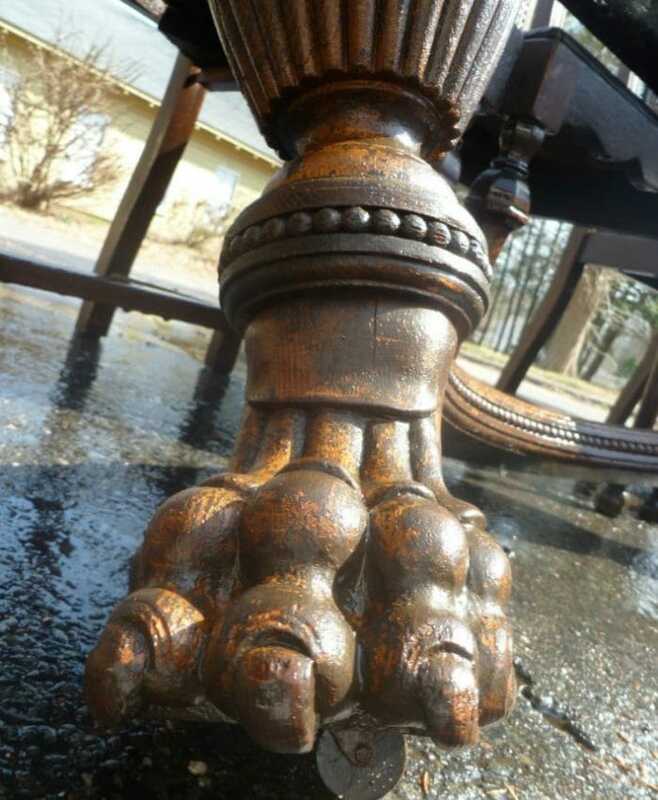 There are single pedestal tables and double pedestal ones. 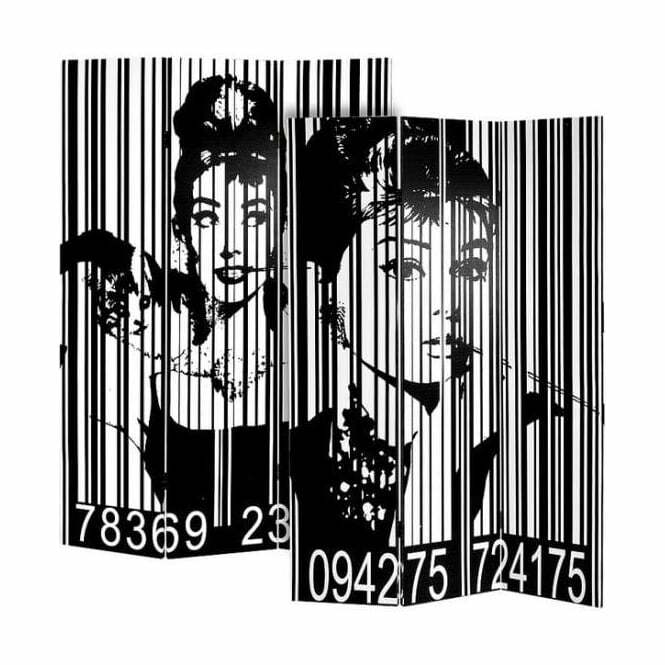 There are some traditional styles, so if you want that Hollywood look, you can have it. If you want modern ones, then there are those styles out there as well. The only tricky thing is; how on earth do you choose the one! 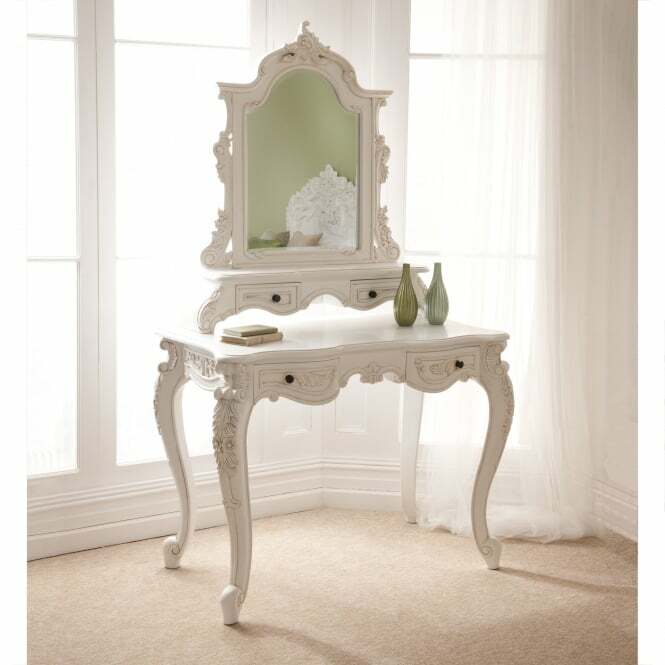 Dressing tables look stunning on their own, but there are a few things to make it look even more striking. 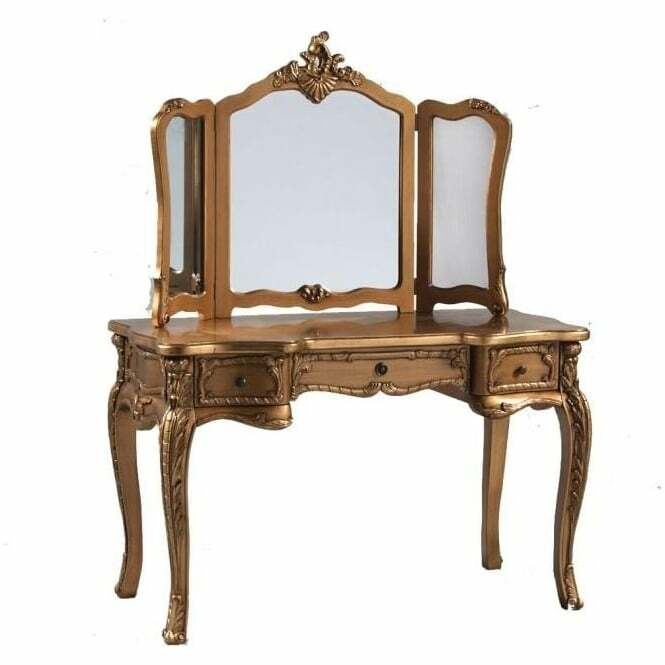 You could light the table from the side or above, that will not only throw focus onto the table, but it will also give you plenty light for putting on your makeup and jewellery. Keep cotton wool or tissues in coloured glass jars and boxes, with sunlight or lamp light on them; they will give off a lovely glow. Put a hook on the wall or side of the table and use a beautiful drawstring bag to store your hair dryer or curling tongs. Of course, you can have a vase of fresh flowers on display. 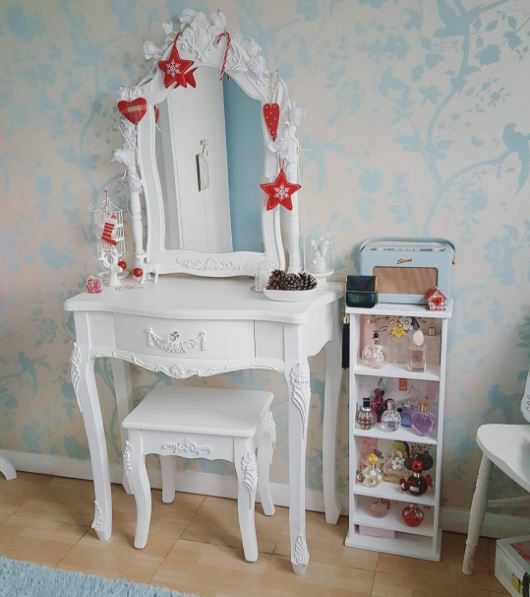 Dressing tables do lend themselves to lovely items like this picture here from one of our customers who decorated her spare room with some of our items. 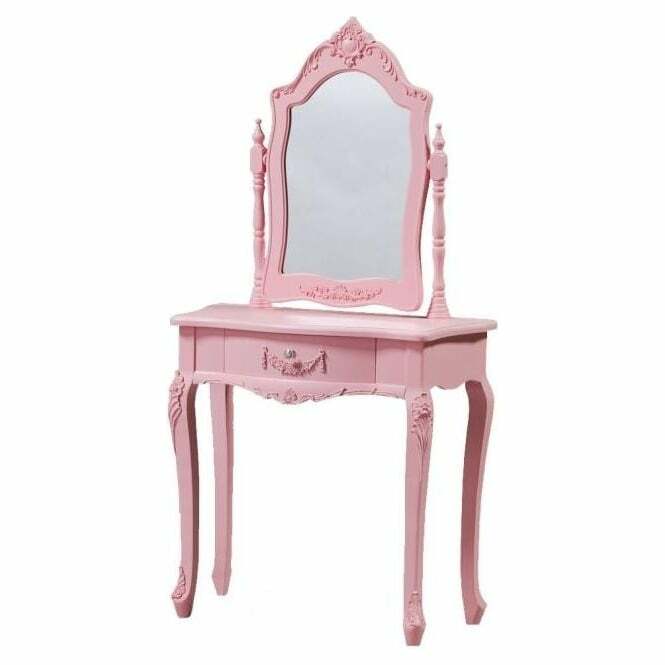 Some dressing tables come complete with mirrors, but many of them don't. 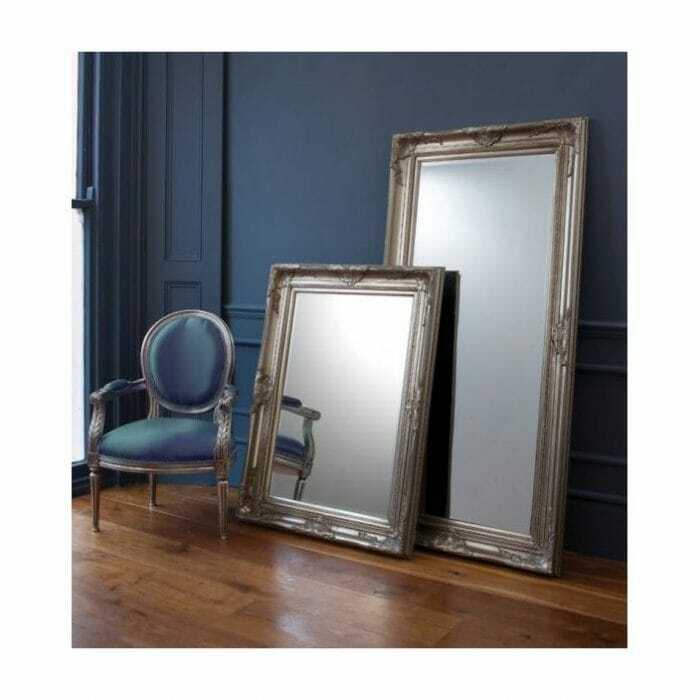 There is nearly as much choice in mirrors as there is in the tables themselves. A single mirror will look good; a triple mirror will look spectacular. Use your table to display your beautiful things; that's what they are designed for. They are large enough to hold your make up on, hair products, facial creams, nail polishes and removers and even eye masks if you wear one to bed. They don't usually come with a drawer but enough space to lay out all of your products to do your face, makeup, nails, hair and everything else. 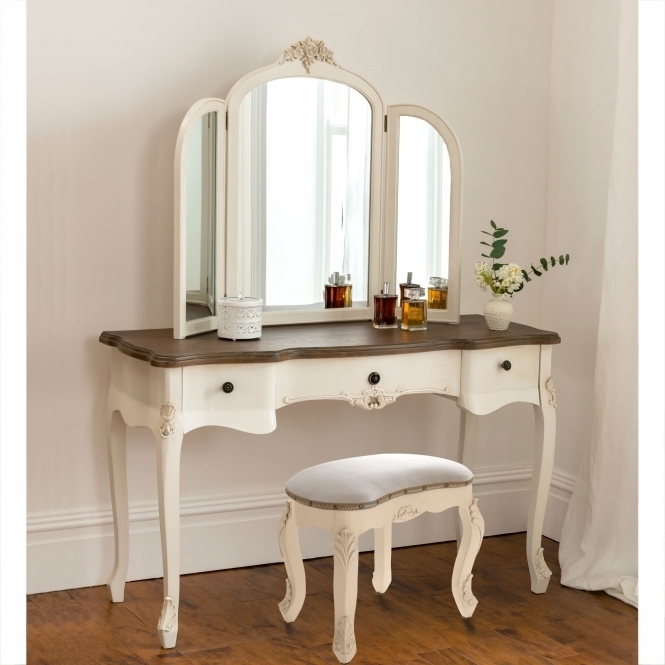 The dressing table stool is handy, and you will find a million reasons to use it! 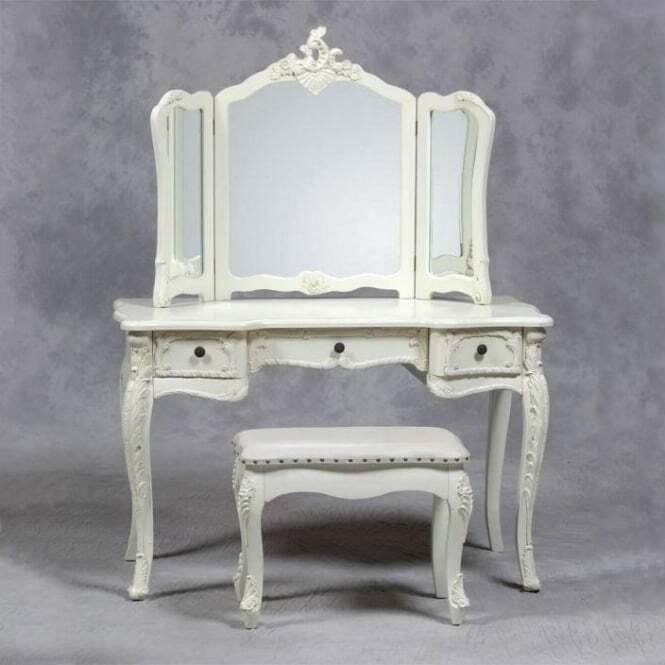 A dressing table may not be the first item of furniture you consider when furnishing your bedroom. In all honesty, it's possibly the last piece of furniture you will think about if you even think of it at all. 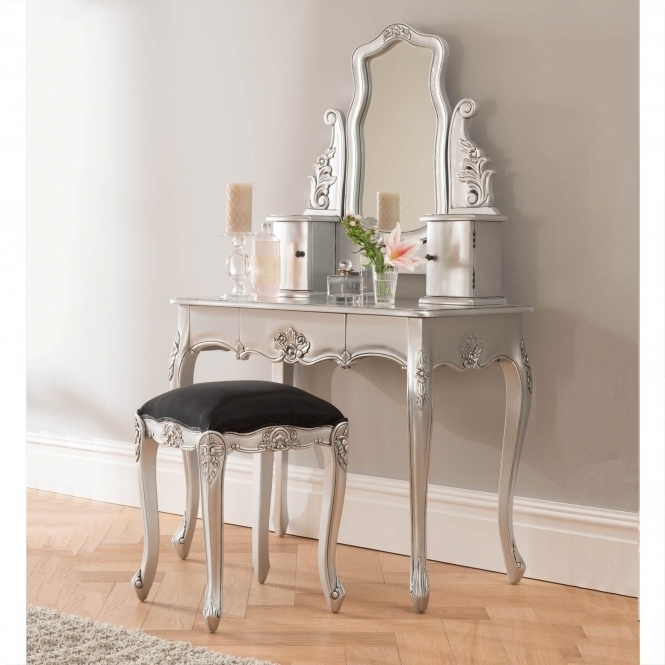 It is true that dressing tables can make a statement in your bedroom. They say you enjoy taking care of yourself. Sitting at a table which is the last thing before bed, applying your night cream and eye cream is a lovely way to end your day. 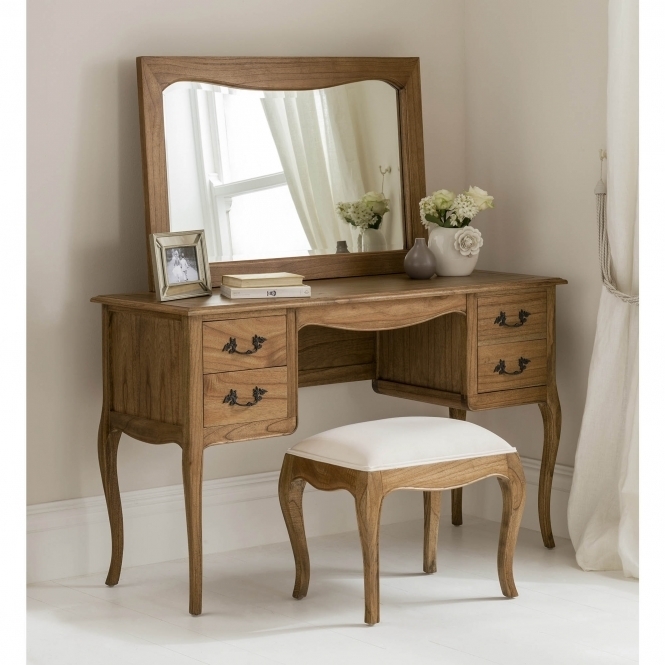 Go on, indulge yourself, choose from the huge range of dressing tables available and look forward to sitting at it.